Coyote Leather "Big Boy" Duck / Goose Shoulder Strap. $64.95. Lined for comfort and long wear, the "Big Boy" has ten loops and a detachable chest strap. Limits of mallards or geese... the "Big Boy" is strong enough to easily handle both, yet small enough to fit in your hunting coat pocket. The wider shoulder strap better distributes the weight of the game, and shorter length holds birds higher against the body allowing for unencumbered walking. 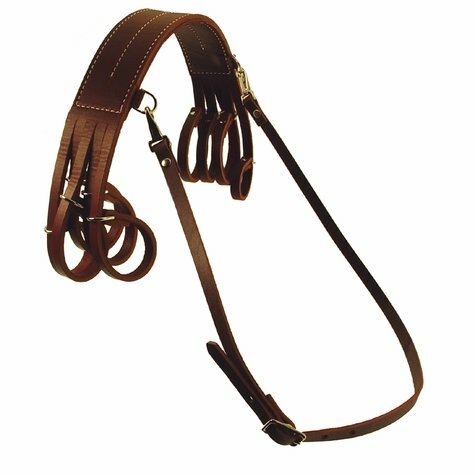 Made from the finest quarter-inch latigo, lined for comfort and long wear, the "Big Boy" has ten loops and a detachable chest strap. Made in the USA.